Here is the weekly review of the top performing Cuban players, who play currently abroad. #1. This week's number one is an international power forward Jasiel Rivero (204-93, agency: Pro Sports, currently plays in Argentina). He led Boca Juniors to a surprising victory over the league leader Quimsa (24-6) 94-85 in the Argentinian La Liga in Wednesday night's game. Rivero was MVP of the game. He recorded 35 points (!!!) and grabbed 5 rebounds in 41 minutes on the court. Boca Juniors (14-14) is placed tenth in the La Liga. It's Rivero's first season with the team. Rivero has individually a very good year with high stats. He averages: 18.7ppg, 5.3rpg, 1.4apg, 1.1spg, 2FGP: 58.3%(161-276), 3FGP: 41.4% and FT: 67.5% in 28 games he played so far. Rivero is currently a member of the Cuban senior national team. #2. Second place goes to former international center Enrique Ramos (202-89, currently plays in Puerto Rico). He was the major contributor in Cariduros' victory against the league outsider Indios (5-9) 106-98 in the Puerto Rican BSN last Tuesday. Ramos had a double-double by scoring 19 points and getting 10 rebounds in 31 minutes. Cariduros de Fajardo (8-8) is placed fifth in the BSN. It was his team's third consecutive victory in a row. This year Ramos' overall stats are: 9.9ppg, 6.3rpg, 2FGP: 61.6%(61-99) and FT: 48.6% in 14 games. He played for the Cuban national team in 2012. #3. The Cuban player who performed third best last week abroad was an experienced former international swingman Yorman Polas Bartolo (191-85, currently plays in Germany). Bartolo could not help Telekom Baskets (15-12) in their last game on Saturday. Despite his good performance Telekom Baskets was crushed 88-67 on the road by the one of league's weakest teams Eisbaeren Bremerhaven (#17). Bartolo was the top scorer with 13 points. Bartolo's total stats this season are: 9.6ppg, 4.0rpg, 2.0apg, 2FGP: 55.0%(71-129), 3FGP: 28.6% and FT: 68.1%. He has a dual citizenship: Cuban and German. Bartolo played for the Cuban national team eight years ago. #4. Forward Yoanki Mensia (197-97, currently plays in Argentina) led Gimnasia to a victory against the 13th-ranked Olimpico de La Banda (13-17) 78-69 in the Argentinian La Liga in Monday night's game. He scored 11 points, grabbed 7 rebounds and dished 3 assists in 22 minutes. Gimnasia y Esgrima Comodoro Rivadavia (19-11) is placed third in the La Liga. It was his team's third consecutive victory in a row. This year Mensia's total stats are: 4.1ppg and 2.1rpg in 27 games. He is also Cuban national team player. #5. International shooting guard Karel Guzman (188-95, currently plays in Argentina) was not able to help Olimpico de La Banda in their game against San Lorenzo (23-3) in the Argentinian La Liga. He recorded 8 points in 20 minutes. Olimpico de La Banda was crushed 102-74 in Almagra by the leading San Lorenzo. It was Olimpico de La Banda's third consecutive loss in a row. Guzman has averaged so far 8.1ppg and 2.6rpg in 28 games. He plays currently for the Cuban national team. #6. Center Javier Justiz (205-92, also represented by Pro Sports, currently plays in Spain) was not able to secure a victory for Zaragoza (13-13) in their game against FC Barcelona (22-4) in the Spanish Liga Endesa. He cannot count Saturday's game as one of the best ones. Justiz scored only 2 points and grabbed 4 rebounds in 19 minutes. Zaragoza lost 86-91 at home to the leading FC Barcelona. Justiz has averaged so far 5.6ppg and 3.6rpg in 27 games. He is an international player who is currently on the senior Cuban National Team roster. #7. Former international power forward Grismay Paumier (205-88, currently plays in France) managed to help Saint Chamond Basket Valle du Gier to win against one of league's weakest teams Caen (7-19) 72-64 in the French ProB (second division) last Friday. Paumier scored 5 points, grabbed 14 rebounds and dished 3 assists. Saint Chamond Basket Valle du Gier (17-9) is placed fifth in the ProB. Paumier has averaged so far 9.6ppg, 5.2rpg and 1.2bpg. He used to play for the Cuban national team ten years ago. #8. Forward Georvys Elias (199-81, currently plays in Spain) couldn't help Daimiel (7-20) in their game against Pozuelo (10-17) in the Spanish EBA (fourth division), despite his good performance last Sunday. Elias scored 12 points, grabbed 7 boards, passed 4 assists and added 4 steals in 30 minutes. But the 14th-placed Daimiel (7-20) was edged 91-89 on their home court in Daimiel by the higher-ranked (#12) Pozuelo in the Group B. There are only two games left until the end of the Regular Season. So now every game will be critical. Elias has relatively good stats this year: 10.6ppg, 6.9rpg, 1.6apg and 1.1spg in 14 games. He used to play for the Cuban national team back in 2009. #1. Howard Sant-Roos (200-F-91, currently plays in Greece). He could not help AEK (17-7) to beat Panionios (9-12). Sant-Roos scored 7 points, had 5 rebounds and made 2 blocks. AEK was defeated 78-74 in a derby game by the lower-ranked Panionios (#7). There are only two games left until the end of the Regular Season. So now every game will be critical. Sant-Roos' overall stats this season are: 6.6ppg, 4.2rpg, 2.5apg and 1.2spg. #2. Ismael Romero (203-C-91, currently plays in Mexico) was not able to help Capitanes (26-13) in their last game. Despite his very good performance the first-placed Capitanes (26-13) lost 79-88 at home to the leading Fuerza Regia in the South group. Romero was the top scorer with 22 points. He also added 9 rebounds in 31 minutes. Romero has individually a very good year with high stats. He averages: 17.7ppg, 7.9rpg, 1.6apg and 1.4spg in 48 games he played so far. #3. Adrian Diaz (209-F/C-93, college: FIU, currently plays in Finland) was the major contributor in a Joensuun Kataja's victory against one of league's weakest teams Ura Basket (9-30) crushing them 112-87 in the Finnish Korisliiga in Saturday night's game. He scored 25 points and blocked 3 shots; quite an impressive performance considering it's only Diaz's third season in pro basketball. Joensuun Kataja Basket (23-16) is placed fourth in the Korisliiga. It was his team's third consecutive victory in a row. They will play only one more game in the Regular Season. And now that game is very crucial. Diaz has relatively good stats this season: 13.9ppg, 4.7rpg, 1.5apg, 1.4bpg and 1.2spg. He has a dual citizenship: Cuban and American. Worth to mention Diaz played also at Eurobasket Summer League, which helped him get the job in pro basketball. Strangely Diaz has never played in Cuba. #4. Juan Pineiro (193-G-90, currently plays in Puerto Rico) led Brujos to a victory over one of league's weakest teams Vaqueros (5-9) 102-96 in the Puerto Rican BSN last Tuesday. Pineiro was the best player in that game. He recorded 21 points and had 3 steals. Brujos de Guayama (10-6) is placed second in the BSN. It was his team's fifth consecutive victory in a row. Pineiro has averaged so far 8.1ppg, 2.1rpg and 1.6apg. #5. Sigfredo Casero-Ortiz (185-PG-97, currently plays in Belgium) contributed to a 1-point Okapi Aalstar's victory against the third-ranked Spirou Charleroi (17-9) 74-73 in the Belgian Euromillions League on Monday night. He scored 19 points and grabbed 7 rebounds in 31 minutes. Crelan Okapi Aalstar (10-16) is placed eighth in the Euromillions League. It was his team's first victory after three consecutive loses. Casero-Ortiz has averaged so far 7.9ppg, 1.5rpg and 1.7apg in 26 games. He is another player who holds two passports: Cuban and Belgian. #6. Darol Hernandez (206-F-89, currently plays in Belarus) contributed to an easy victory against the second-ranked Rubon crushing them 99-79 in the Belarusian Premier League in Saturday night's game. Hernandez recorded 6 points and grabbed 7 rebounds. Hernandez has relatively good stats this season: 11.1ppg, 8.3rpg, 2.4apg and 1.9spg. #7. Yunio Barrueta (193-F/G-93, agency: Inception Sports, college: Barry, currently plays in France) was not able to secure a victory for Sluc Nancy in their game against SPO Rouen in the French ProB (second division). Barrueta scored 6 points, made 3 passes and 3 steals. His team was defeated 82-68. Barrueta has relatively good stats this season: 11.4ppg and 3.7rpg. He has both American and Cuban nationalities. Strangely Barrueta has never played in Cuba. #8. Marlon Diaz (200-C-98, currently plays in Argentina) couldn't help La Union in their game against Racing Chivilcoy in the Argentinian La Liga Argentina (second division). Diaz scored 6 points and grabbed 8 rebounds in 25 minutes. His team lost 75-83. Diaz has averaged so far 4.1ppg and 3.6rpg in 36 games. #9. Yankiel Moreno (189-G-90, agency: Interperformances, currently plays in Italy) contributed to a Baltur Cento's victory against the 15th-ranked Termoforgia JE 94-80 in the Italian Serie A2 (second division) in Sunday night's game. He scored 9 points and added 3 assists. Moreno has averaged so far 6.0ppg, 3.8rpg, 4.2apg and 1.1spg. He also holds two passports: Cuban and Italian. Despite Moreno's Cuban nationality, he previously played for the Italian U18 national team and is probably not eligible to play for the Cuban team. We bring you last week's top performances from Cubans who are playing abroad and who all have had prior experience of national team duties at youth or senior level. #1. This week's number one is an international power forward Jasiel Rivero (204-93, agency: Pro Sports, currently plays in Argentina). He led Boca Juniors to a surprising victory over the second-ranked Atenas (21-18) crushing them 103-81 in the Argentinian La Liga last Monday. Rivero was MVP of the game. He recorded 22 points and grabbed 6 rebounds. Boca Juniors (13-13) is placed tenth in the La Liga. Rivero has individually a very good season with high stats. He averages: 17.8ppg, 5.2rpg, 1.5apg, 1.2spg, 2FGP: 57.8%(141-244), 3FGP: 42.6% and FT: 66.5%. 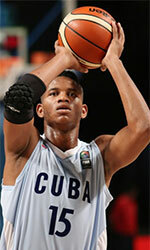 Rivero is currently a member of the Cuban senior national team. #2. Second place goes to an experienced former international swingman Yorman Polas Bartolo (191-85, currently plays in Germany). He led Telekom Baskets to a victory against the closely-ranked Brose Baskets (18-7) 92-81 in the German BBL on Sunday night. Bartolo had a double-double by scoring 11 points and getting 10 rebounds in 26 minutes. Telekom Baskets Bonn (15-11) is placed sixth in the BBL. This year Bartolo's overall stats are: 9.4ppg, 4.1rpg, 2.0apg, 2FGP: 54.5% and FT: 67.8% in 26 games he played so far. He has a dual citizenship: Cuban and German. Bartolo played for the Cuban national team in 2011. #3. The Cuban player who performed third best last week abroad was an international forward Yoanki Mensia (197-97, currently plays in Argentina). He contributed to an easy victory against the closely-ranked Obras Basket (17-10) crushing them 103-81 in the Argentinian La Liga on Wednesday night. Mensia scored 10 points and grabbed 5 rebounds. Gimnasia y Esgrima Comodoro Rivadavia (17-11) is placed fifth in the La Liga. Mensia's total stats this season are: 4.0ppg, 2.0rpg, 2FGP: 59.6%(28-47), 3FGP: 44.4% and FT: 82.6%. He is also a member of the Cuban senior national team. #4. Center Enrique Ramos (202-89, currently plays in Puerto Rico) could not help one of league's weakest teams Cariduros (0-1) in their last game. Despite Ramos' very good performance Cariduros lost 94-98 on the road to the higher-ranked (#5) Capitanes. He scored 17 points and grabbed 5 rebounds in 34 minutes. This year Ramos' total stats are: 8.0ppg and 5.6rpg in 11 games. He used to play for the Cuban national team back in 2012. #5. International shooting guard Karel Guzman (188-95, currently plays in Argentina) contributed to an Olimpico de La Banda's victory against the 18th-ranked Libertad Sunchales (8-19) 81-71 in the Argentinian La Liga in Sunday night's game. He scored 11 points and added 3 assists. Olimpico de La Banda (13-14) is placed 11th in the La Liga. It was his team's third consecutive victory in a row. Guzman has averaged so far 8.5ppg and 2.6rpg. He plays currently for the Cuban national team. #6. Power forward Grismay Paumier (205-88, currently plays in France) was not able to help Saint Chamond (16-9) in their last game on Friday. Despite his good performance Saint Chamond was defeated 78-66 in Roanne by the leading Chorale de. Paumier recorded 12 points and grabbed 5 rebounds. Paumier has averaged so far 9.8ppg, 4.8rpg and 1.2bpg. He is a former international player as he played for the Cuban senior team ten years ago. #7. Former international forward Georvys Elias (199-81, currently plays in Spain) was not able to secure a victory for Daimiel (7-19) in their game against Zentro Basket (11-17) in the Spanish EBA (fourth division), despite his very good performance in Saturday night's game. Elias was the second best scorer with 14 points. He also added 6 rebounds in 27 minutes. But the 14th-placed Daimiel (7-19) was badly defeated 96-76 in Madrid by the higher-ranked (#10) Zentro Basket in the Group B. There are only three games left until the end of the Regular Season. So now every game will be critical. It's Elias' first season with the team. Elias has relatively good stats this year: 10.5ppg, 6.9rpg and 1.5apg in 13 games. He used to play for the Cuban national team ten years ago. #1. Howard Sant-Roos (200-F-91, currently plays in Greece) led AEK to an overtime victory against the 11th-ranked Lavrio (6-16) 100-94 in the Greek A1 in Saturday night's game. He recorded 13 points and grabbed 6 rebounds in 34 minutes. AEK Athens (17-5) is placed third in the A1. It was his team's seventh consecutive victory in a row. There are only four games left until the end of the Regular Season. So now every game will be critical. It's Sant-Roos' first season with the team. This year Sant-Roos averages: 6.7ppg, 4.1rpg, 2.5apg and 1.1spg in 20 games he played so far. #2. Ismael Romero (203-C-91, currently plays in Mexico) was the major contributor in Capitanes' victory against the leader Fuerza Regia (31-9) 94-93 in the Mexican LNBP (second division) in Friday night's game. He scored 18 points and grabbed 8 rebounds. It was the game of the round between two top 3 ranked teams in group South. Capitanes Ciudad de Mexico (26-13) is placed first. Romero has individually a very good season with high stats. He averages: 18.0ppg, 8.1rpg, 1.6apg and 1.4spg. #3. Yunio Barrueta (193-F/G-93, agency: Inception Sports, college: Barry, currently plays in France) led Sluc Nancy to a victory over the 11th-ranked Lille Metropole (10-15) 78-69 in the French ProB (second division) last Saturday. Barrueta was the best player in that game. He recorded 19 points and grabbed 4 rebounds in 31 minutes; quite an impressive performance considering it's only Barrueta's third season in pro basketball. Sluc Nancy Basket Pro (18-7) is placed second in the ProB. Barrueta has relatively good stats this year: 11.6ppg and 3.8rpg in 24 games. He has a dual citizenship: Cuban and American. Strangely Barrueta has never played in Cuba. #4. Darol Hernandez (206-F-89, currently plays in Belarus) contributed to a 3-point COR-Borisfen's victory against the fourth-ranked RCOP Tsmoki (6-22) 88-85 in the Belarusian Premier League last Saturday. Hernandez recorded 12 points and grabbed 8 rebounds. COR-Borisfen Mogilev (26-4) is placed first in Places 1-4 group. His team will play only one more game in the Second Stage. And now that game is very crucial. Hernandez has relatively good stats this season: 11.5ppg, 8.4rpg, 2.5apg and 1.9spg. #5. Adrian Diaz (209-F/C-93, college: FIU, currently plays in Finland) could not help Joensuun Kataja (20-16) in their last game. Despite Diaz's good performance Joensuun Kataja was badly defeated 97-78 on the road by the lower-ranked (#6) Kouvot. He was the second best scorer with 12 points. Diaz also added 5 rebounds in 23 minutes. There are only three games left until the end of the Regular Season. So now every game will be important. Diaz has relatively good stats this year: 13.4ppg, 4.8rpg, 1.5apg, 1.2bpg and 1.2spg in 20 games. He is another player who holds two passports: Cuban and American. Worth to mention he played also at Eurobasket Summer League, which helped him get the job in pro basketball. Strangely Diaz has never played in Cuba. #6. Juan Pineiro (193-G-90, currently plays in Puerto Rico) contributed to Brujos' victory against the league outsider Atleticos 83-79 in the Puerto Rican BSN last Wednesday. Pineiro scored 7 points, had 4 rebounds and dished 3 assists in 22 minutes. Pineiro has averaged so far 7.0ppg, 2.1rpg and 1.6apg in 13 games. #7. Sigfredo Casero-Ortiz (185-PG-97, currently plays in Belgium) was not able to help Okapi Aalstar (9-15) in their last game on Sunday. Despite his good performance Okapi Aalstar was crushed 102-72 in Brussels by the higher-ranked Basic-Fit (#4). Casero-Ortiz was the second best scorer with 11 points. Casero-Ortiz has averaged so far 7.3ppg, 1.3rpg and 1.8apg. He has both Cuban and Belgian nationalities. #8. Marlon Diaz (200-C-98, currently plays in Argentina) was not able to secure a victory for La Union in their game against Atenas in the Argentinian La Liga Argentina (second division), despite his very good performance in Monday night's game. Diaz had a double-double by scoring 19 points and getting 10 rebounds in 33 minutes. But his team lost 65-78. Diaz has averaged so far 4.0ppg and 3.5rpg in 35 games. #9. Experienced Pedro Bombino (206-C-0, agency: Pro Sports, currently plays in Argentina) managed to help Gimnasia y Esgrima Comodoro Rivadavia to win against the closely-ranked Obras Basket crushing them 103-81 in the Argentinian La Liga last Wednesday. He scored only 2 points. Bombino has averaged so far 1.0ppg and 1.5rpg. #10. Juan Ferrales (187-G-91, college: Barry, currently plays in Norway) contributed to Kongsberg's victory against the closely-ranked Gimle BBK 81-76 in the Norwegian BLNO on Monday night. He scored 8 points, grabbed 6 rebounds and dished 4 assists in 40 minutes. Ferrales has relatively good stats this year: 13.3ppg, 4.4rpg, 5.7apg and 1.5spg in 24 games. He also holds two passports: Cuban and American. Strangely Ferrales has never played in Cuba. Artemisa and Villa Clara share the top with 11-7 records. Last night Artemisa beat Sancti Spiritus 76:72 with a strong first half. Camaguey meanwhile edged Villa Clara 93:88. The latter produced a massive 30-15 surge at the end of the game, but could not save the game. Earlier Villa Clara beat Guantanamo 101-98. Andy Bofill and Didier Gonzalez stepped up for the winners with 22 points each. SORIA Yoannis replied with 33 points and ROUSSEAUX Ernesto scored 26.